The grey striped one is APE MAN. He is modeled after my boyfriend who sang "im an ape man" at karaoke the other night. He does not have a tail (because he is an ape) BUT he DOES come with a fashionable banana and button eyes! 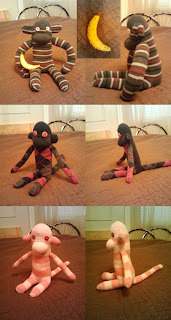 The argyle one is named MAGENTA and she is a nice skinny bright eyed monkey. Her back is black and everything is argyle and shes got felt eyes. She looks sad. Give her a good home. The pink one is LITTLE STUBBY and has button eyes. But dont hate on her ladies and gents! She will make a fabulous pet! These are all available at my Etsy store!